I have just finished my first tub of Monster Milk by CytoSport and am ready to a do a full review of the protein product. Monster Milk comes in 10 flavors, and I chose my “go to” flavor of chocolate. All flavors contain the same ingredients, so the only difference in the review for a different flavor would be the taste. I give Monster Milk a 9.5/10. I have already purchased my next tub of Monster Milk, which shows you how good of a protein product it is. First lets take a look at the nutritional value of Monster Milk and let you know exactly what it is. 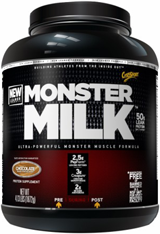 Monster Milk is a protein powder that delivers 50 grams of protein per serving (which is two scoops). It does have some healthy carbohydrates as well with 13 grams of carbs and only 3 grams of those are sugar (5 grams of fiber). Besides the protein and carbs, Monster Milk also contains some creatine and branch chain amino acids (BCAAs) to make it a complete protein supplement. Within the 50 grams of protein you will receive 5 different types of proteins, and a mix of fast releasing proteins and slower releasing proteins. You will get whey protein hydrolysate, whey protein isolate, milk protein concentrate, milk protein isolate, and micellar casein protein. In your two scoops you will get a 3:1:1 ratio of the popular BCAAs (7.5 grams of leucine, 2 gras of isoleucine, and 2.2 grams of valine). You will also receive 5 grams of glutamine, which is great for recovery. So is Monster Milk a post workout shake? Not exactly, although it can be if mixed with a carbohydrate supplement. Because Monster Milk doesn’t contain enough carbohydrates to be the only thing you take after a workout you will need to either consume it with a carbohydrate supplement or just use it as a normal protein supplement outside of post workout meals. What I do is right after my workout I take my Vitargo S2 (strictly carbohydrate supplement) and then follow that up with a serving (2 scoops) of Monster Milk mixed with water, ice, a banana, and a small amount of natural peanut butter. If you want you could blend Monster Milk with some natural oats in a shake for a post workout “meal”, but I try and get my carbohydrates in liquid form so that it gets through the stomach quickly for glycogen refuelling. How does Monster Milk taste? Very good! I really liked the taste of the Chocolate flavor and for review purposes would rate it a 9/10. I wouldn’t rate it as high as my favorite MyoFusion, but this is a much better product that includes some BCAAs, creatine, and more. I’ve been recommended the Cookies N’ Creme flavor so you could also give that a try if you’re a fan of that flavor. Will Monster Milk help me build muscle? Absolutely. Monster Milk has a number of great muscle building ingredients, including a big 50 grams of a variety of proteins. 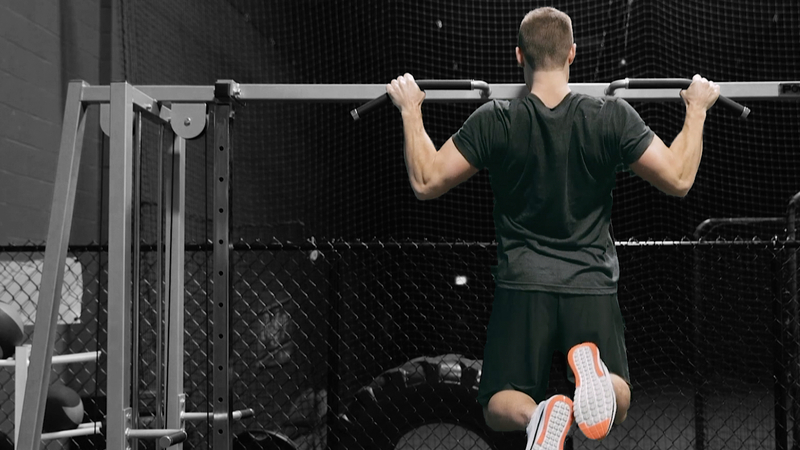 You will also get the amino acids that are very important in recovery and muscle building. Depending on your diet, adding 2 servings of Monster Milk throughout your day could be just what you need to add some muscle. Can I take Monster Milk when trying to lose fat? Yes. If your goal is fat loss you can still take Monster Milk. With just 13 grams of Carbohydrates and only 3 grams of sugar you would have no problems fitting this into a meal plan for weight loss. Overall I highly recommend Monster Milk, as CytoSport has done it again with another great protein product that also tastes great. I hope you enjoyed my review and can now make a decision on whether or not to buy it! Check out BodyBuilding.com for the lowest prices.